I imagine ever since registered nurses and certified nursing assistants started working together, there have been controversies regarding their roles. They should work as a team and compliment each other. Neither side should take advantage of the other. 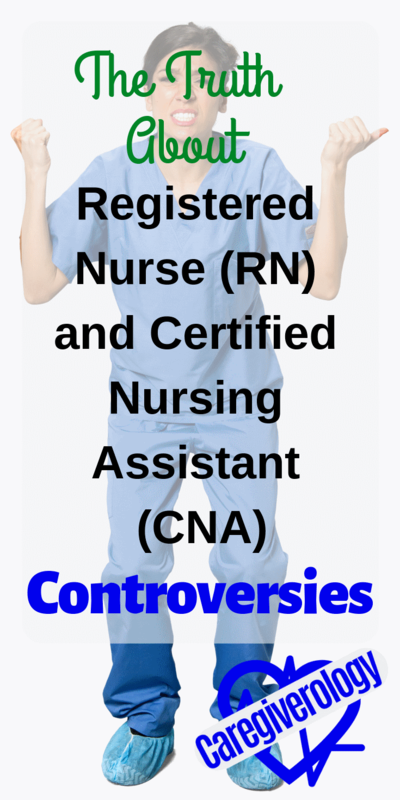 Contrary to what many of them believe, nurses aren't exempt from doing CNA work. I still do CNA work constantly even though I no longer work as one. In order to have great teamwork, you have to be willing to help each other. On the other hand, CNAs are more limited because there are laws that prohibit them from doing some things that nurses can. Nurses don't have that excuse. They can do everything a CNA can and should be willing to do so as needed. Many CNAs actually have issues with nurses they work with because the nurses aren't willing to assist them. Nurses may say that's not my job but they are sadly mistaken. Patient care in general, including CNA work, is every nurse's job. Of course it works both ways. There are CNAs who can take advantage of nurses. Just because a nurse can do the work doesn't always mean they should. Yes, nurses get paid more but that doesn't necessarily mean they should do more. I've had shifts working as a CNA where I couldn't catch a break whatsoever. Is that the nurse's fault? No. Can it be? That depends. The nurses working could be having the same kind of shift. If the nurse themselves isn't drowning like the CNA and has time to assist them, then I can't think of a good reason why they shouldn't. It is a part of teamwork and should be encouraged regardless of the place of employment. This of course doesn't always happen. It can be extremely difficult to know which employee is at fault. For other instances, it can be pretty clear who needs to improve. It is often both sides that need to work on their teamwork skills. Prioritization takes a part in this as well. If a nurse desperately needs to be doing something but is instead doing a task the CNA can perform, that could be an issue. Even if the CNA is doing something at that very moment, it may be something they can get back to doing after assisting the nurse while the nurse does what the priority is for them. Delegation is a part of the nurses job. The CNA should not be the one delegating to the nurse. This may sound silly to some but it can happen, especially when there is an experienced CNA and a new nurse. That's not to say CNAs can't make suggestions or ask a nurse to do something, but ultimately, the nurse delegates. The same is true for doctors. They delegate to the nurses. The nurses can still make suggestions and even ask the doctor for assistance in some cases, but the doctor still has the final say in many situations. This of course does not rule out the fact that if a nurse feels they are putting a patient at risk, they should not be forced to perform a specific task just because there is a doctor's order for it. You have to use your own judgment as well in order to protect your patients. This is a difficult and sensitive topic to discuss. I am not personally defending either side because I have been on both sides. The correct answer to every situation isn't always clear. There are a lot of gray areas where both parties can be right and wrong at the same time. If you have an opinion on this matter or would like to share an experience you've had, please write a comment down below or for a deeper conversation, let's talk about it here. Some things just need to be thoroughly discussed. Getting other people's insight from an outside perspective can sometimes shed new light on the situation.